This has to be the easiest appetizer recipe ever. It requires no cooking and just minor assembly. The recipe is from one of my fellow food bloggers, The Merry Gourmet, who is celebrating her blogiversary this week. Jennifer is one of the most dedicated food bloggers I know (I actually don’t know her personally but we have connected because she lives in my hometown). She is constantly thinking about blogging, bettering her cooking and writing skills and staying connected to the vast network of food bloggers around the country. I admire her commitment and wish I had it in me to stay that engaged. Thank you MG for the inspiration! After my incident with my squirrel friend on Wednesday night, I couldn’t have been more happy that I chose this recipe. 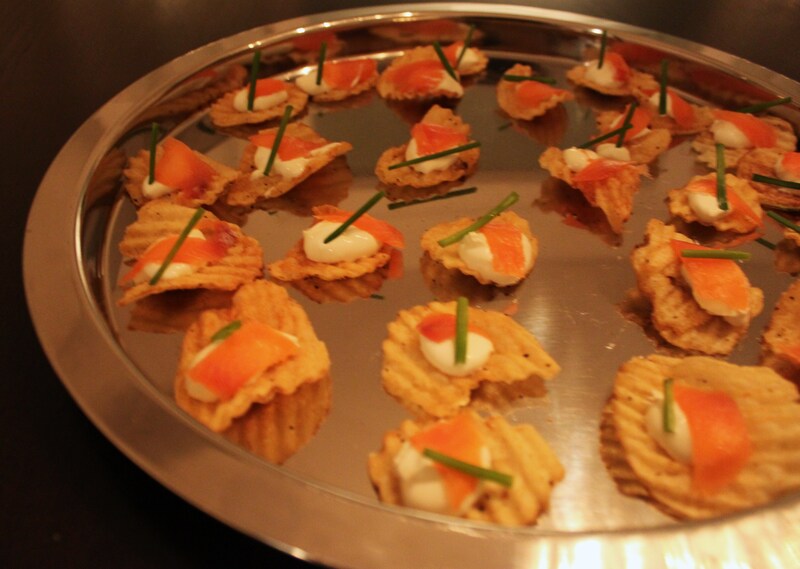 It is literally a salt & pepper kettle cooked potato chips topped with a dab of sour cream and a piece of smoked salmon. The hint of green with a piece of chive makes it look that much more fancy. The Merry Gourmet uses creme fraiche and mixes lemon zest in – but I went for the cheap and lazy route. No one noticed my short cut and everyone was surprised how tasty these were. I highly recommend these on your next weeknight of chaotic entertaining!